Every campaign displays its most recent statistics on the Campaigns page. 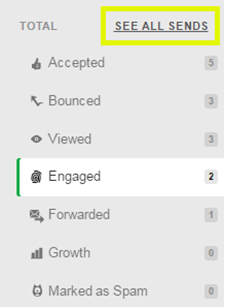 To review the stats for individual mailing campaigns, click the more stats button. The stats from the most recent mailing will display. To see all the individual mailings for this campaign, click the See all Sends link in the lower left sidebar. Under Details, click the Stats button beside the individual campaign mailing you want to view stats for.